This is the only sliver of peach cake that survived the party. 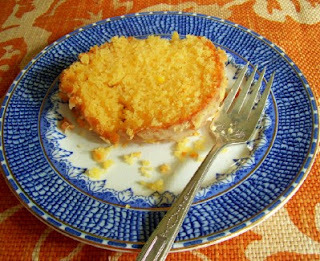 This recipe comes from Les Passees' Well Seasoned cookbook, though Retro Food shared a similar cake using apricot nectar. It is also the only recipe for which I use cake mix. Sift 1 box yellow cake mix, 4 Tbsp. flour, and 1 3-oz box peach jello together. Beat in 4 eggs and 1 cup oil. Mix in 1 cup mashed peaches with juice. Canned peaches provide a more intense flavor. Bake in greased Bundt pan for 40-60 minutes at 350. The original recipe calls for a peach buttercream icing, but that's too much trouble for me. I pour a simple glaze of peach puree and confectioner's sugar across the top of the cooled cake. Garnish the platter with sliced fresh peaches in season. TOTAL COST: about $3 when you buy the ingredients on sale. Apart from the eggs, you can keep all the ingredients in the pantry. If our house weren't about to be torn to bits (2 leaks being repaired under the slab tomorrow), I'd make this! Peaches are on sale at Sprouts right now for only 49 cents a pound. Wish I could take advantage of that! Yum yum!! I have a cake-mix-based chocolate cake that I love to take for desserts. Now I'll have to try this one! Meredith: Hi! The peach cake looks wonderful, but I was wondering have you ever substituted applesauce for any of the oil with this recipe? I would like to try this, but wanted to cut the fat content some. Thanks! This looks divine! You know, it's the only recipe for peach cake I've ever come across -- I wonder if it's an American favourite? I think I'd like to introduce it over here in Australia! Thanks for the peach cake recipe, but what's really exciting is: oh wow, Meredith, your link to the Apricot Nectar cake recipe!!! (retrofoods...) I was just telling my kids about that cake this week. My mother used to make it for very special occasions only; probably because the nectar was so dear. I can remember seeing the can on the pantry shelf. She would only purchase it the day before baking because on more than one occasion it had been carelessly guzzled by a pantry raider. Then when she opened the can, what aroma! There was never much left over to drink, just an inch or so. Thanks so much for sharing this recipe. It sounds very moist and full of flavor--please describe the flavor and moistness etc to us.How you would rate it. The cake looks amazing. I'm going to have to try this one out. My hubby likes any kind of cake as long as it is baked in a Bundt pan :) and I am always looking for new recipes to try. Thanks so much for sharing the recipe. Yes! I look forward to trying the apricot nectar version. With all the Mexican groceries available now, fruit nectars are easy to find and relatively cheap. Nicole, I am lazy when it comes to baking. To me, the Bundt pan is the perfect marriage of pretty shape and convenience. I don't think I've baked a layer cake in years. Nannykim, this cake is ultra moist. I made it this time with fresh peaches, and the flavor was not as intense as when I used a can of raggedy ripe freestone peaches in syrup. Next time, I'll use the canned peaches for puree and decorate with the fresh slices. Sarai, let me know how the applesauce substitution works! This is an exceptionally moist cake, and I don't think it would suffer from a reduction in oil. I wonder if you might not try adding more peach puree instead of applesauce, though. yum. you can freeze eggs if you find a good sale. just beat them up, pour them into ice cube trays (spraying the tray with a little oil first helps them to pop out easily), the freeze. 1 cube = 1 egg. they can then be used in baking, omelets, scrambled eggs, egg drop soup, egg fried rice, etc. Another well done. This looked so good I made it tonight for dessert. YUMMY!!!!! My entire family LOVED it. Thanks for a great recipe. God Bless! I made this recipe yesterday too, it is so delicious! Thanks for sharing. I too, linked this recipe on my blog. It was excellent. Thank Meredith! I made this cake this weekend and everyone loved it. I couldn't find a small peach jello and had to weigh out half a large box. I think if I made it again I would try decreasing the oil by 1/4 cup though. "sift a box of yellow cake mix"
What? That's not a recipe! What a waste of internet space. Sheesh. Ruby, I'm hoping your tone was more joking than harsh! If it's in a cookbook, I think it qualifies as a recipe. This one comes from the heady days of 1950's mix cooking, when the newest and exciting products filled the grocery. Like you, I prefer scratch recipes--this peach cake is pretty much the only one I use a mix for. Mostly because I have never bothered converting it. If you find a non-mix recipe, please share!